Continued from stage 3, page 1. There are a number of places in Pamplona worthy of a visit including the walls and some of the lovely squares and parks. One of the most impressive buildings in Pamplona is the gothic cathedral, la Catedral de Santa Maria la Real, and is a must see whilst you are in the city. The Cathedral was built during the 14th and 15th centuries over the remains of a Romanesque church that had collapsed but archaeological investigations have found that it was built over a Roman capitol. The façade is Neoclassical but the interior is gothic, apparently taking its inspiration from the French cathedral at Bayonne. 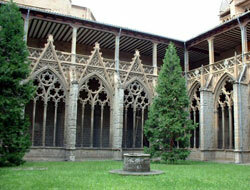 In front of the presbytery is the impressive mausoleum of Carlos III el Noble and is wife Leonor de Trastámara but the jewel in the cathedral's crown is that of its gothic cloister. Built between 1286 and 1472 it is one the very few intact cloisters of this quality to be found in Europe. When the archaeological investigations were taking place in this area they discovered the remains of a Roman market, forum and baths. Inside the cloister you will find a small museum which shows the evolution of both monumental and decorative gothic sculpture from the 13th century. Close by to the cathedral is one of the most beautiful parts of the city. This is the highest point in Pamplona, an area known as the Bastion de Redín and the building here is called el Meson del Caballo Blanco (white horse inn). Built on the remains of an old palace of which only the Cruz de Mentidero remains the Caballo Blanco has the most outstanding views out across the city. This building used to be a pilgrim hostel but it is now a restaurant. This area is still regularly visited by the pilgrims who entered the city through Portal de Francia. The fortified 12th church la Iglesia de San Nicolás was the main religious building in the borough that was named after it. Its main function was to defend against its neighbours and it did this through its thick walls, iron doors and 3 watch towers, of these 3 only one remains. This is one of the main landmarks to be found in the Casco Antiguo or old town. Most of the interior is gothic but little remains of the gothic exterior because of many alterations undertaken in the 19th century. Inside the church you can find a rather large baroque organ built in 1769. 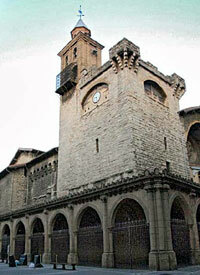 In one of the other boroughs is the 12th century Iglesia de San Cernin or San Saturnino. 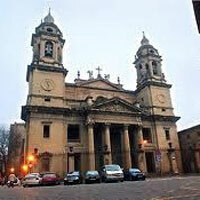 The church is believed to have been built over the remains of a Roman temple dedicated to the goddess Diana. 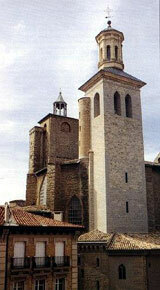 Like the Iglesia de San Nicolás it is a fortified church and was the central point in the borough known as San Cernin. It too had a military and defensive function helped again by its thick walls and two high towers. On the top of the one of the towers is a weather vane in the shape of a cockerel. Known as the Gallico de San Cernin the cockerel is one of the most popular emblems of the city. The clock in this same tower is used every morning during the Fiesta de San Fermin to announce the moment when the rocket is let off to announce the beginning of the Encierro or the running of the bulls. 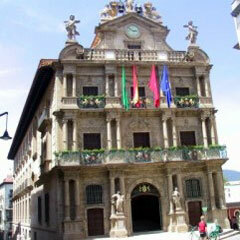 The Casa Consistorial is Pamplona's town hall. In 1423 when Carlos III decided to tear down the walls between the 3 separate boroughs and reunited the city he built the original Casa Consistorial to house the singular city council. The original building was demolished in 1752 and a new one built in 1760. Of this second building only the façade remains. For those of you that come during the Fiesta de Fermin it's around this building that everyone congregates on the first day of the fiesta waiting for the Mayor to start the festivities. Thousands of people gather here waving their red pañuelos (handkerchiefs) high above their heads and chanting “San Fermin” waiting for the first chupinazo (rocket blast). At noon the Mayor comes out onto the balcony and fires the first chupinazo shouting in both Spanish and Basque “People of Pamplona! Long live San Fermin”. There are a number of hostels in Pamplona both private and municipal as well as a number of places for the pilgrim to have a meal and a drink. During the Fiesta de San Fermin many of the hostel's prices skyrocket and the albergues usually close. So it is probably a good idea to spend the night at one of the albergues on the route into Pamplona or stay at one at one of the next stops on the Camino.